In 2003 my wife and I decided to look for some real estate where we could walk the beaches and wade in the salt water. We went as far north as Asseteague Island in Virginia in our quest. Then we traveled from Corolla to Oak Island, visiting Nags Head, Hatteras, Ocracoke, Wilmington, Southport and several less well known spots. We fell in love with the Southern Outer Banks. After searching in vain for an affordable place near the water in Beaufort, we found a great place in western Cateret County on the White Oak River. By 2007 there were North Carolina license plates on our cars, so I think we are here to stay. Why we love it here? It is hard to say that any place is perfect. However, for those who think a walk on the beach is better than a trip to the mall, the Crystal Coast is hard to beat. 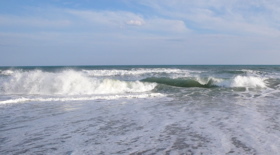 My Crystal Coast, Salt Water on Your Feet site also has a number of articles for people considering a move to the Crystal Coast. We’ve even found a great church home at Cape Carteret Presbyterian Church. It is a friendly area with a great future. So right now it is the spot for us. I often write about the area in my other websites. This is a link to a simple map of the area. There are more detailed ones in our Emerald Isle Travel Guide. You can find a introduction to the area and links to most of my other blogs at this link or visit this page for the basics. There is more about me at this page.